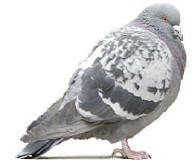 Call us today we can solve your pigeon problems by cleaning under the units and closing off the access so that pigeons can't nest under the units and then add live trapping to the clean and close service and get rid of most all of the flying rats on your roof top. Pigeons just love to nest under large HVAC units on commercial building as well as swamp coolers and smaller air conditioners that are mounted up on 4x4 wooden blocks. 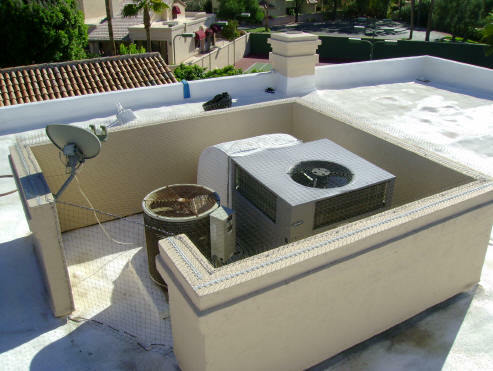 A/c units and other coolers allow just enough room for the pigeons to nest under the protection of the units and get out of the sun. Leave the swamp pads and cover off of just 1 old swamp cooler on your warehouse and you have provided enough nesting space for 1/2 a dozen mated pairs of pigeons or more, which means that you will have dozens of pigeons on your roof top in a short period of time plus add in the fact that pigeons are flocking birds and so other pigeons flying by will stop and move in to be close to a flock of other like minded pigeons and then it gets really bad from there. On smaller units a cable tension system holds the standoff brackets securely in place allowing installation without penetration of the HVAC unit with screws. Adding two sheet metal screws per corner adds strength. Larger units with spans greater than 10 feet should have sheet metal screws used to fasten the standoff to the unit. The protective net is net ringed to the supporting perimeter cable and down the corner seams. The weighted line is also net ringed securely to the bottom of the net to insure a clean and tight installation. Very large commercial HVAC units like at this bottling plant sometimes need a lot more than just small brackets, then need a complete structure built around the units to attach netting to and stop the birds from getting sucked into the machinery. A zipper can be installed in the net to allow access to the interior of the protection system. 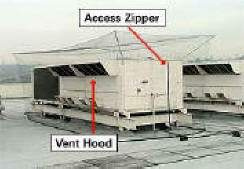 In the second example described here a 6' zipper is installed that allows easy access for maintenance. Netting was installed over the duct work so the pigeons could not get under. On some of the rubberized roofing we could not attach the lower netting to the roof deck so we had to use weighted chain. Call Arizona Wings N' Stings for all your unusual bird control problems. "Have Birds - We'll Travel"
Large Job or small job - We can do it all. Copyright � 2009 Arizona Wings-N-Stings All rights reserved. Revised: 06/06/12.